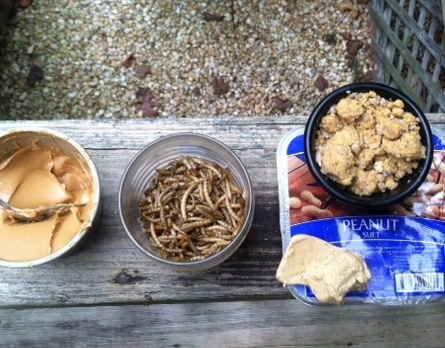 Swell Recipe for Window Bird Feeders & Surprise of the Day! Experimenting with a home-made seed mix the other day, a double take was certainly in order as I glanced beyond the window feeder… discovering two of the biggest visitors ever! 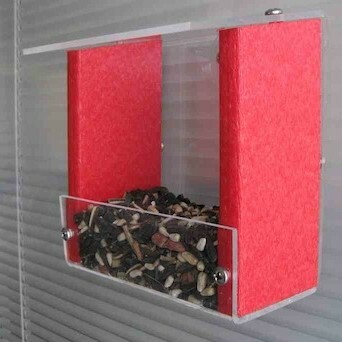 But first the delectable mix that so many bird species seem to adore, it’s perfect for tray style window bird feeders and any type of platform or dish feeder too. There’s no measuring and it mixes up easily in a gallon zip-lock bag. With a little something for everyone, many bird species have been spotted taste testing! The yummy mix is full of fat & protein, and we’ve seen chickadees, titmice, cat birds, Carolina wrens, bluebirds, woodpeckers and others trying it on for size. Approval seems unanimous, definitely a keeper! And the big visitors? Take a gander at these 4-legged birds! 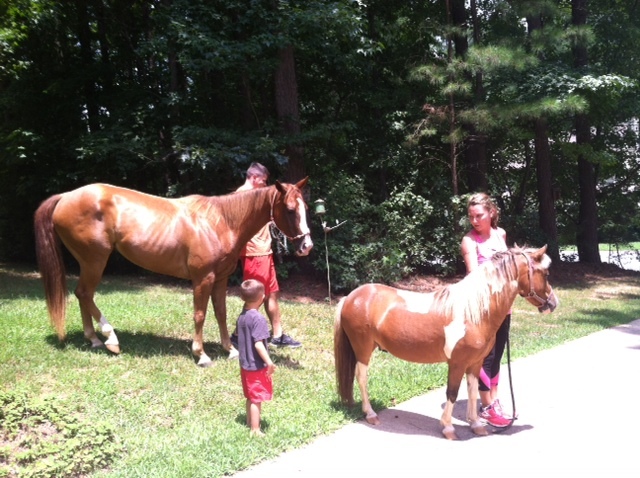 Living in a subdivision it’s not everyday one sees horses grazing freely, but that’s what was out there! Failing to snap a photo of them loose in the back because panic ensued and who to call was the task at hand. After reaching animal control services, I was most relieved to hear the horse’s people were indeed looking for them, and they arrived in minutes. Off they went- end of excitement for the day, the pony sure was a little cutie, he’s the one who likely pushed the gate open too! Recently the question was posed by a customer on our Facebook page: “Any advice for keeping birds fat & happy through the coming cold snap?” Absolutely! Basically, birds need higher fat and carbohydrate type foods that are easier and/or faster to digest during frigid weather. 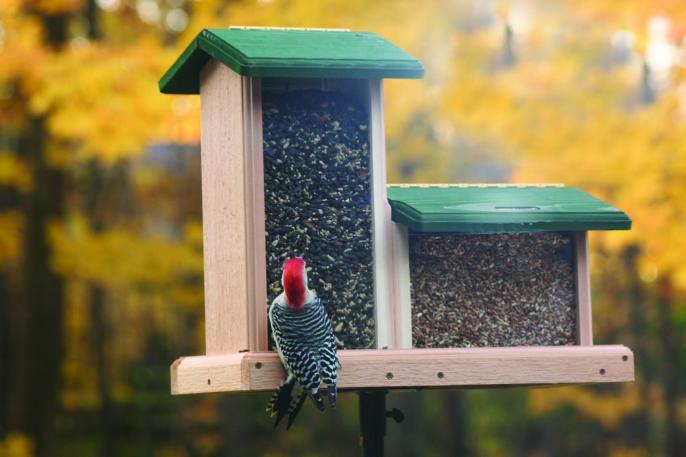 Aside from topping off basic seed feeders, you can utilize window bird feeders and other platforms for these kinds of treats. Suet cakes broken into chunks, any kind of nuggets or crumbles, even home-made suet mixes and bluebird delight (recipes on our website) are ideal for open style window feeders. Water… don’t forget that fresh water’s extremely important when all natural sources have frozen. Birds will flock to a heated bath throughout the entire winter season! Since freezing weather always brings more birds around to feeders, you can easily set up a new feeding space or two without additional feeders per se. 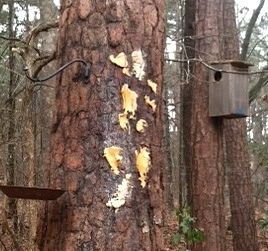 Offer more of those high fat, high carb foods using suet or peanut butter smeared right on a tree trunk! Nuthatches, warblers, chickadees and every species of woodpecker will go for it in a snap. The extra calories serve them well helping to maintain body temperature and warmth overnight. While you’re toasty warm inside, please remember feathered friend’s survival tactics and help them out during frigid weather! 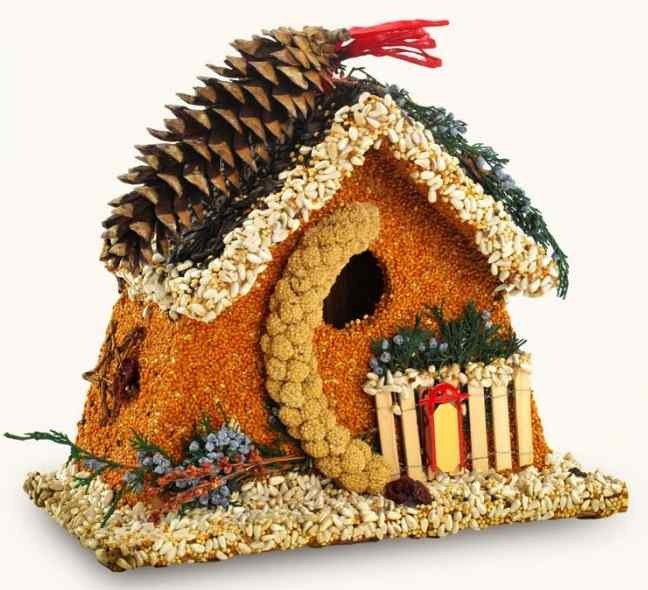 Kudos to the company who makes this edible birdhouse, because that’s all they do… specialty wild bird treats. And birds will tell you they do the job right! The Birdies Bed Breakfast not only looks good for an awesome present, it keeps on giving too. Really like two gifts in one, a bird feeder at first, so the recipient gets an excuse to sit back, relax and enjoy watching some resident birds. It then becomes a real nesting site for spring. They may even catch someone roosting inside on a blustery day trying to escape the elements. With 1.5-inch entry, it’s perfect for bluebirds, chickadees, warblers, wrens and other favored songbirds. The full size wooden house beneath the quality seed may be stained or painted, or even left natural to weather over time. 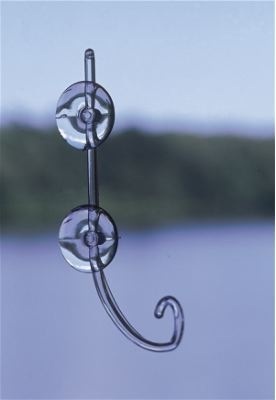 A sturdy hook’s attached for easy hanging… just keep it away from squirrels! Best to use edible birdhouses in sheltered areas as feeders, or with baffles or weather guards. 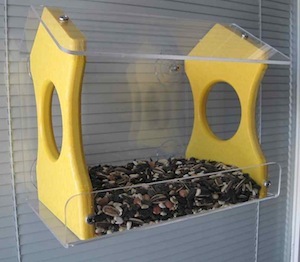 They’ll feed more birds over a longer time if protected from harsh weather and pesky critters. Once the seed’s consumed, the house should be hung from a branch in a quiet part of the yard. Keep watch in early spring (sure hope it’s earlier than last year) when local birds start claiming nest sites and attracting mates to raise their young. 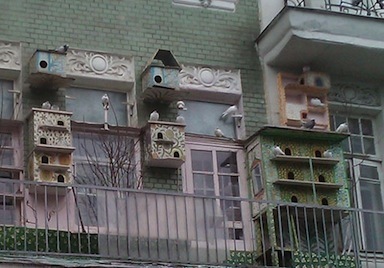 Now, what mama bird wouldn’t be totally impressed with digs like these? Instant Window Bird Feeders – Even Window Bird Baths! They say the kitchen is the heart of the home, with meals, conversation and most comings and goings through the door leading to the garage where vehicles are parked. Builders know it’s the sink where much time is spent and usually place a window above it for natural light, views of trees (if you’re lucky) and lush green yards. Placing window bird feeders within this view is an optimal spot for catching the great outdoors and nature’s happenings without interrupting daily routines. If by chance the deck is off your kitchen or breakfast room, its rails are absolutely perfect for the birds! 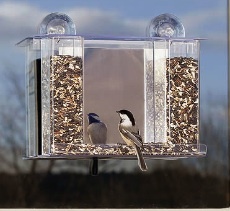 The feeder need not necessarily mount on the window itself! A really cool and versatile bracket thing called a deck ring lets you add an instant feeder, or even a bird bath in seconds. It clamps on with simple hardware (no tools required) and best of all there’s no damage to rails. The sturdy iron ring will accommodate heavier ceramic bowls, as simple plant saucers are perfect for feeders or baths. 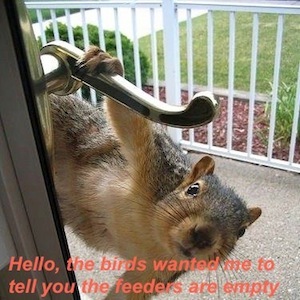 Say you don’t want any mess that birdseed can bring? Opt for fresh water- it’s by far the easiest and best way to entice feathered friends! Add a heater to that bowl in winter and the activity promises to mesmerize… it’ll be the most popular spot in the yard. With close-up views like these, you’ll see birds from another perspective. Right now many are looking a little sickly with streaked plumage that’s half dull and half bright. But it’s just the molting process that happens every fall. Birds are shedding old, tattered feathers for new ones to help them through another season of cooler weather. Entice more feathered friends to your place and liven up the view from that kitchen sink quickly and easily by placing a feeder or bath right on the deck rail. 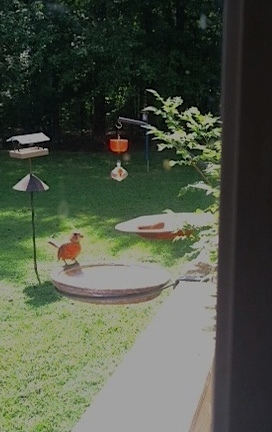 how would window bird feeders ever be versatile? Because with The Great Hang Up, you can turn most smaller hanging feeders into window bird feeders. Although it may not look like much, this innovative window hook holds up to three pounds securely. It leaves options wide open for attracting avian friends… up close and personal, with the hook facing both up or downwards. 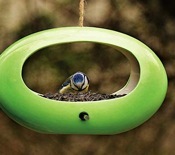 The Mod Oval shown here would be great as a window feeder, offering a full view of dining birds. Come to think of it, a window birdbath would be fantastic too! Since fresh water is a great way to entice birds, small dish-type feeders (with no drainage) would serve this purpose well. The Glass Globe feeder is versatile enough to fit the bill. Accommodating seed mixes, suet & nuggets, peanuts, even fruit in summer, plain old water is an excellent option as well. Available in ruby red or lime green… just think of the possibilities! 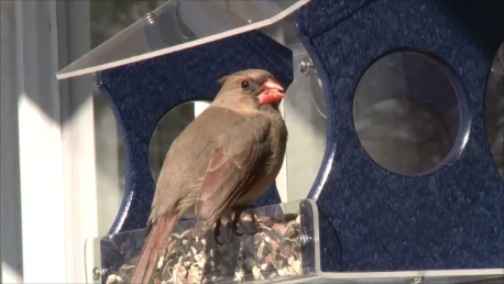 Aside from the awesome viewing opportunities, here’s another reason why window bird feeders are good – location, or placement is important for birds’ safety. 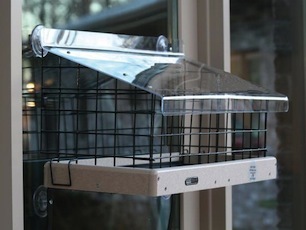 According to The Cornell Lab of Ornithology, placing a feeder within three feet (or more than thirty feet) from windows greatly helps to prevent window strikes. They say billions of birds die each year from these fatal crashes. Using the above reference for feeder placement will not afford birds enough room for gaining speed and crashing into the window. So think outside the box because it doesn’t have to actually say “window feeder” to be one! It’s not too far of a flight, from the feeders over to the tree bearing the cavity where her babies were raised. 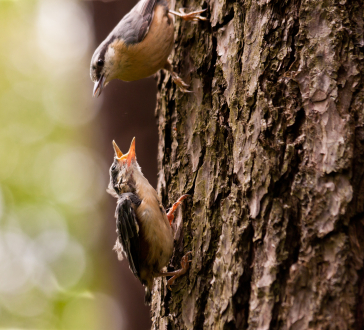 Mama nuthatch grabs sunflower hearts quickly feeding her newly fledged babies. It’s been a really dry, really hot summer thus far. Early July temps feel like the end of August and everything is already parched! More so than aesthetics, this brutal weather has a profound effect on wildlife, including resourceful birds. More so than usual, roadkill has been rampant, likely many young venturing further out of normal range in search of food and water. Even wild birds do what they need to in order to keep babies fat & happy. In all the years of backyard birding, I’ve never seen such activity at feeders in the thick of summer (other than nasty common grackles). Natural food sources have been depleted by drought and high temperatures… even the bugs that bug us at dusk are fewer than usual. Gnats and mosquitoes are not as bad, even the pesky fly may have taken a hiatus! Because of these conditions, adult birds are taking full advantage of backyard feeders… and any kind at that! An adult cardinal was grabbing seed from a platform feeder and passing it along to his baby on the ground below. An adult thrasher was pecking through squirrel mix on the ground to feed her baby in the back along the tree line. This mama nuthatch took about fifteen trips from our window bird feeders over to the familiar tree where eggs were laid and chicks hatched. Scurrying to feed six newly fledged birds, the bird feeders containing sunflower hearts proved to be most welcome. If you typically feed wild birds, but don’t think it’s necessary in summer… think again! Lots of babies out there with busy parents in search of food to raise their young. Please feed the birds and always, always offer a fresh water source. As simple as a pan of water, or a saucer from an old garden pot will do the trick just fine.